The Tree of Life has the brain as the roots, and the nervous system as the trunk and branches. There are three main divisions in its function. They are the cerebrospinal, the sympathetic and the parasympathetic systems. These must co-operate and flow into and out of each other, as does all energy that has polarity. 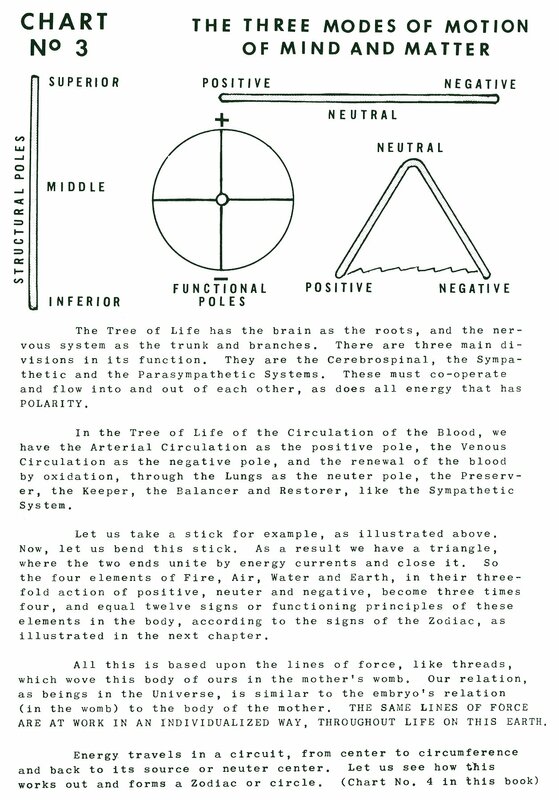 In the Tree of Life of the circulation of the blood, we have the arterial circulation as the positive pole, the venous circulation as the negative pole, and the renewal of the blood by oxidation, through the lungs as the neuter [neutral] pole, the preserver, the keeper, the balancer and restorer, like the sympathetic system. Let us take a stick for example, as illustrated above. Now, let us bend this stick. As a result we have a triangle, where the two ends unite by energy currents and close it. So the four elements of Fire, Air, Water and Earth, in their threefold action of positive, neuter [neutral] and negative, become three times four, and equal twelve signs or functioning principles of these elements in the body, according to the signs of the Zodiac, as illustrated in the next chapter. All this is based upon the lines of force, like threads, which wove this body of ours in the mother's womb. Our relation, as beings in the Universe, is similar to the embryo's relation (in the womb) to the body of the mother. The same lines of force are at work in an individualized way, throughout life on this Earth. 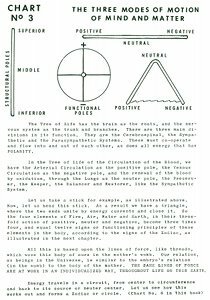 Book 1, "Explanation of Chart No. 3"